Chances are some people who love aquatic animals do have their own aquariums. If you fall into this category, you would need the best aquarium air pump. An air pump is a vital accessory for any aquarium. The principal purpose of having the air pump is to ensure the water is oxygenated, helping the fish survive in the fish tank. The air pump prevents the water from stagnating, thereby allowing the air to circulate in your aquarium properly. We all know having thus can have a positive effect on the quality of the fish produced. 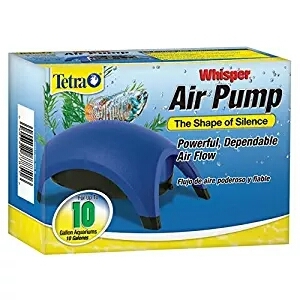 When selecting an air pump for your aquarium, there are certain things to look out for, ranging from the amount of disturbance it produces in terms of noise to how pocket-friendly it is for customers. We, however, would do our possible best to help you secure the best aquarium air pump around. Below are the factors to consider when looking to purchase the best aquarium air pump for your aquarium. 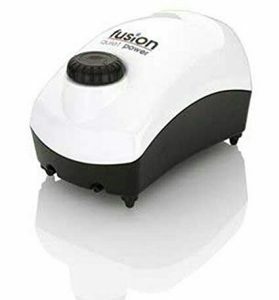 • Cost: Before setting out to purchase an aquarium air pump, the cost of purchase and installation should be at the forefront of factors to consider, as everyone would want to get the best deals around. It’s advisable to structure a budget to that end, and stick as religiously possible to this same budget to avoid the temptation of overspending. • Size of the tank: Larger tanks are not particularly more work than smaller tanks, as it is easier to keep water chemistry stable in larger tanks than small ones, owing to the concentration difference of chemicals in the water. A major part of the maintenance work does not need double the time for double the size. A regular partial change of water may require one more bucket of water to be replaced in a larger tank. This doesn’t necessarily mean that the amount of work done was double, as you already have the siphon and bucket ready. • The number of fish the tank can safely hold: The number of fish the tank can hold safely is dependent majorly on its shape and not only on the volume. For instance, some fish spend their entire lives near the bottom, if you decide to double the tank volume by doubling its height, this won’t allow you to keep more bottom-dwelling fish. • Ease of usage: This basically implies how easy it is to set up and operate effectively. This also takes into cognizance safety measures regarding its safe use. • Total number of reviews from clients: This aspect is significant as it cannot be overemphasized. This gives you an insight into what you are purchasing, its possible pros and cons from the angle of people who have already used it and can authoritatively speak about it. Well, enough of beating around the bush and let us get to our top 10 best aquarium air pumps out there. 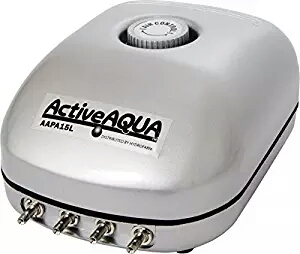 The active Aqua Commercial Pump is a great air pump for the money. This pump provides power perfectly for multiple farms and air stones simultaneously. 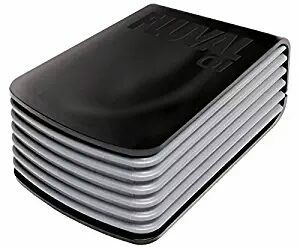 It possesses an electrical, magnetic air compressor system in a high-quality aluminum case, protecting it adequately from the effects of degradation on the long term. To complement its durability, this air pump for aquarium features wear and tear resistant material for the cylinder and piston. Another exceptional feature that makes it stand out is its ability to switch on and off each outlet. This is possible due to the presence of multi-outlet divider. This pump’s electrical, magnetic air compressor offers a high water pressure and output, giving it a performance of around 1100 gallons of cycle in an hour. It is fitted with multiple levels of mufflers to cushion the effect of the noise. This pump’s low power consumption makes it a good buy, making this a steal for potential customers. It, however, may get warm after an extended period of use. Tetra company is a leading brand that produces the best aquarium air pumps. The Tetra Whisper Air Pump for Deep Water application is one of the most powerful air pumps which is used for deepwater operations. This pump can generate enough power to drive some air stones in more than one aquarium. It is an astute piece of engineering which provides air to protein skimmers, ponds, and tall tanks. The pump is perfect for situations producing a lot of back pressure such as deep tanks, multiple air stones, and long decorator air stones among others. With this pump, it is easy to create a properly aerated and healthy aquatic environment, this ensures the aquarium is oxygenated, keeping fish healthy, comfortable and in good condition. The pump features a unique dome shape design and rubber feet that stick on the glass of the tank. This device boasts a limited lifetime warranty from the manufacturer and is relatively easy to use. 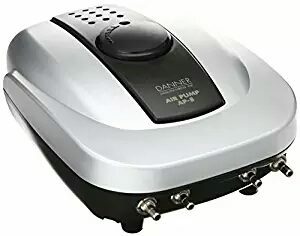 This lightweight air pump which has eight outlet air pumps is one of the top air pumps in the market that is very easy to use, and has great ease of assemblage. Need I say this unit also saves you loads of money on energy consumption? Yes, you didn’t misread, as it only uses 7 watts of power. It is also relatively quiet, aerating the water properly and giving very little disturbance to the fish. This possesses a good Engine, as it can power large amounts of air into the pump. Its user-friendly design makes it easily operable. It, however, isn’t waterproof, which is the only downside to an otherwise efficient machine. Air pumps play an important part in any aquarium, especially when you have an aquarium with high oxygen demand. 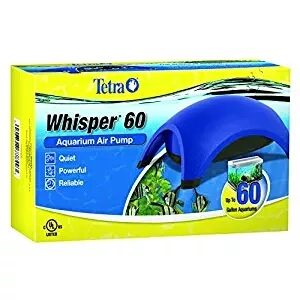 The Tetra Whisper provides the best aeration for your fish tank, this 60-gallon accessory is a wonderful piece of engineering, producing minimal noise and ensuring maximum air flow. It also possesses a done shape which affects sound, thereby leading to quiet operations. This pump is effective for deepwater operations as it maintains a powerful diaphragm offering ample airflow. It can also be utilized in different ways like powering sponge filters, air-driven ornaments. This pump will be more than a good buy, as it has no known cons so far. A quality air pump will promote a healthy environment for fish, as the water will be properly oxygenated. To do this, you would need a top-rated pump that would improve the life of your fish. Selecting an air pump can be an arduous task for certain aquarium owners. However, the Active Aqua Air pump is here to smooth all your worries out. This pump comes in only one universal size having several outlets. It can cycle 6.6 gallons of water per minute and 400 gallons per hour. This pump boasts of energy efficiency, therefore saving you money on energy consumption. This pump features a special artificial rubber to maintain a stable air flow output and pressure which is easily adjustable. You need to note to keep this pump above the water level to prevent water backflow due to air tubing. Ignoring this can lead to permanent pump damage. Another combination of power and stealth, this quiet machine produces a consistent flow of air due to its advanced swing arm diaphragm design. This pump has a thick wall outer casing and a noise suppressing baffle chamber making it quiet during operation. Its strong and quality construction offers a long lasting performance for aquariums as large as 300l. The performance of this air pump depends on the number of air valves in use. This pump also needs to be above water level to prevent back siphons. It comes with a 2-year warranty against normal use defects. A typical aquarium air pump is crucial, as it helps dissolve oxygen in water, boosting overall aquarium health. This pump like the name implies gives peace of mind due to its silent operation. It can provide enough air for up to 55 gallons, and can also work when there is a power outage. The pump is battery operated, with both batteries being 2”D” batteries providing up to 48 hours of continued usage. It can also automatically switch from electric to battery operated. It has an attractive and compact design, helping it fit into most spaces. When an aquarium pump is not employed, water tends to stagnate, leading to unhealthy living conditions for the fish. Purchasing this air pump will put an end to that. This pump helps fish feel comfortable by bringing about water movement and adding oxygen to the fish tank. The pump is designed with 2 air outlets, this implies it can provide oxygen in two fish tanks simultaneously. It generates very little noise, as it has a multi-level muffler guaranteeing a quiet operation. It is useful for both small and medium-sized fish tanks and boasts of quality and versatility all-round. This budget-friendly pump which boasts an incredible performance rate is one of the top guns out there. 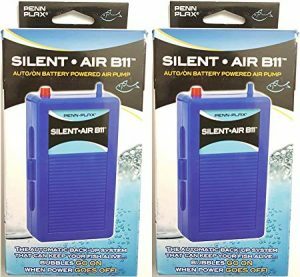 This quiet air pump is one of the top picks on the market presently. This pump has a patented baffle system providing dependable air output, and generates enough power to power your accessories. This pump also has a control knob, letting you adjust the flow of air. This pocket-friendly device is rugged and durable, making it stand the test of time. It, however, is not perfect for tanks over 10 inches. I’d advise anyone going for an air pump to coo this engineering marvel. 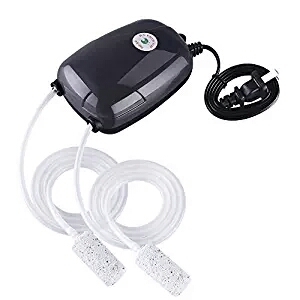 Aquarium air pumps are unique accessories that any aquarium owner should not lack. If you want to replace an old pump, the EcoPlus is the perfect option for you. This versatile pump can be utilized in some places from fish farms to hydroponic systems. 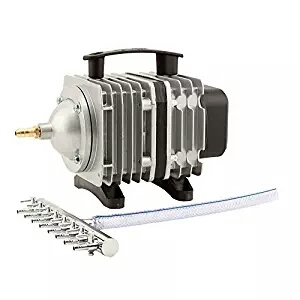 The pump’s cylinder and piston are made with top-notch material, making it durable and strong, this pump can also operate without oil and is another one on the list of noiseless air pumps. A good air pump in your aquarium is as important as quality fuel in your automobile or good food in your system. Simply put, its usefulness can’t be understated. 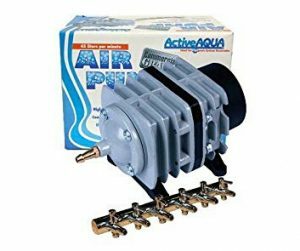 We hope we’ve been able to effectively guide you through the world of the best aquarium air pumps, helping you effectively navigate it and know the best choices to make when purchasing best air pumps.